The cinema was a good way to forget about the raids, but you took a risk in choosing to go there. 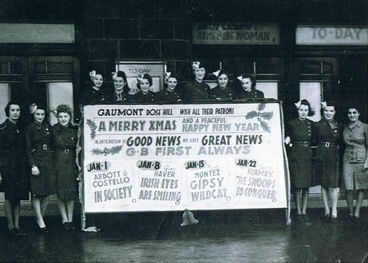 Christmas 1944 at The Gaumont. 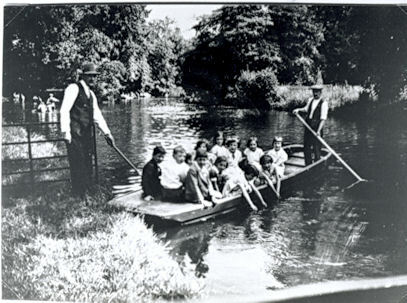 Rose Tearle, the manageress, is far left. This page was added by Irene Amos on 09/02/2011. Jean Fitches's account (above) reminded me of a dreary, wintry Saturday afternoon early in 1941. Mum and Dad had taken me to the Gaumont- just the other side of the roundabout from us in Reigate Avenue. We'd sat through the whole, long programme of B certificate film, A film, adverts, cartoon and whatnot, during which an announcement was flashed on to the screen to tell the audience that an air-raid warning had sounded, in case they wanted to leave. It was ignored by everybody, even when desultory anti-aircraft gunfire could be heard outside. When we'd seen the whole programme through, we emerged to find low, grey cloud cover and it was spitting with rain. Some louder ack-ack fire prompted Mum and Dad to urge me to keep close to the shops, in case of any falling shrapnel. We had just rounded the corner and were approaching St Helier Avenue, when I caught sight of something out of the corner of my eye. Turning, I was shocked to see, just above 'The Rose' pub (Where the Co-op now is) and looking simply huge- a Dornier Do17 bomber! One airscrew was just "windmilling" slowly, whilst the other engine was spluttering. It seems incredible to say this now, but I swear I noticed, in that second or two of shock, when I froze to the spot, the front gunner swinging his gun round and moving back, out of the "perspex" nose. The rear gunner also, was making some sort of move forward (? to get ready for a crash, perhaps). I noticed their sandy-coloured flying suits. I panicked! I ran headlong across St Helier Avenue, (Dad calling out from behind, "Mind the bloody road!"). I pelted headlong towards the central rows of elm trees in Green Lane. There, I came to an abrupt halt, as it seemed I was running right underneath the stricken 'plane. I got a lecture afterwards about not looking properly before crossing the road! P.S. I never did find out where that Dornier crashed, but it was last seen heading towards St. Helier station when I last saw it! Can anybody add any information on that...? The enemy plane over Rose Hill. In respect of Bill's comment, one of our interviewees, Jack Law, told us this: A plane got hit somewhere, and I was walking just over at Rose Hill more or less where the back of the Co-op is now, just walking up there, and this plane came so low you could see the gunner sitting at his gun. He had everything to shoot at if he wanted to shoot at it, so whether they had fired their guns at the pedestrians or not, I don't know, but certainly not at Rose Hill. And I think that plane crashed somewhere near Woodcote Hill. I've just seen Jack Law's account. Thank you for that. I wonder if it could have been the same incident? 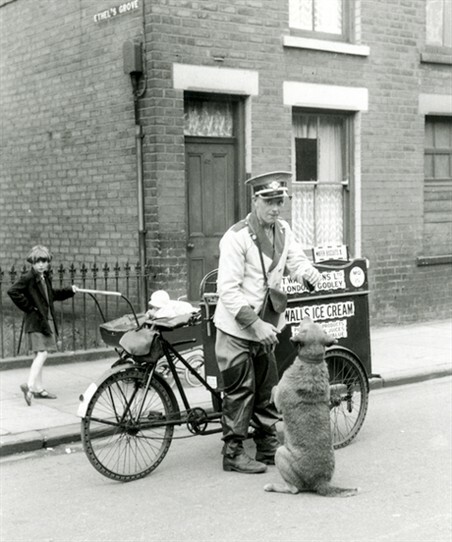 I recently researched a website mentioning WW2 events around the Wimbledon area. There was an account there of a Dornier bomber crashing into some houses and catching fire. The whole crew apparently, perished. 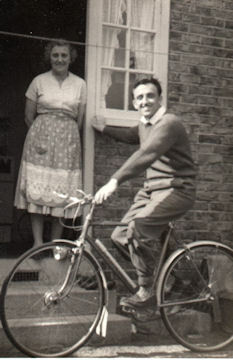 I knew a Jean Fitches who lived in Sawtry Close off Green Wrythe Lane. She attended No9 girls school.Would you be that Jean? I lived in Sherbourne Crescent. I went into the Merchant Navy when I was Sixteen and lost touch with most of my school friends. Sorry to have to inform you that Jean Fitches passed away in February 2017. She married my cousin Frank Kitchener and had six children. The family lived in Camberley when their eldest daughter Jane age 16 was killed in a car accident. The whole remaining family then moved to Falmouth to start afresh I guess where I believe the remaining children still live.